Amanda Fleet: More Murder and Mayhem! 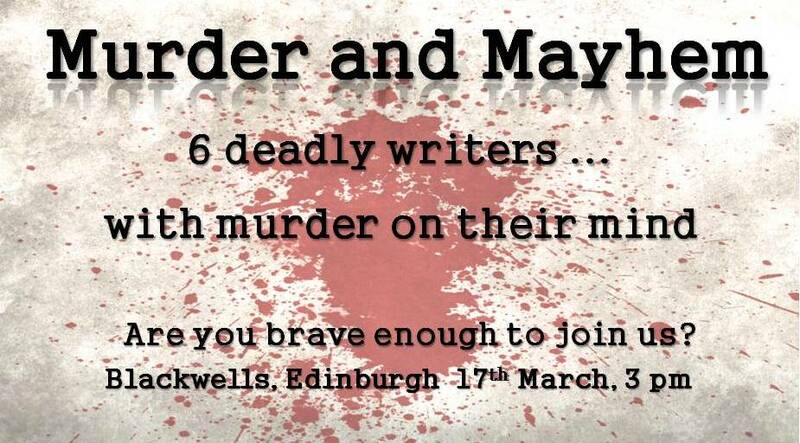 See if you can spot which of the crime writers is the murderer, and win a freebie if you manage to catch them out. There's also plenty of time for chatting about the writing life, getting published and writing crime. Each time we've done this, it's been a hoot, so if you're in the area, pop in and see for yourself. Entry is completely free. See here for more details. The writers are: Tana Collins, Wendy H. Jones, Lesley Kelly, Chris Longmuir and Jackie McLean. 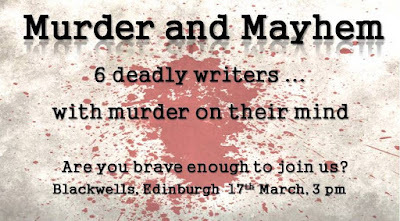 An Edinburgh based crime writer who is author of the Jim Carruthers detective series, set in the East Neuk of Fife. “Robbing the Dead”, her début novel became a Scottish top 10 best seller, as did her follow up, “Care to Die” which was published in June 2017. Army Officer turns to a life of crime. Author of the best selling DI Shona McKenzie Mysteries and the Fergus and Flora Mysteries. Crime fiction for all ages. “Killer’s Crew,” the 5th book in the DI Shona McKenzie Mysteries won the Books Go Social Book of the Year 2017. “The Dagger’s Curse,” her first YA mystery is shortlisted for the Woman Alive Readers Choice Award. Author of “The Health of Strangers” and “A Fine House in Trinity.” Longlisted for the McIlvanney Award 2016. A Dundee International Book Prize winner, Chris writes both contemporary and historical crime fiction set in Dundee. She is the author if the Dundee Crime Series and the Kirsty Campbell Mysteries. Her latest book is "Death of a Doxy" - the third in her Kirsty Campbell historical crime series. Glasgow based author of “Toxic,” set in Arbroath and Dundee and shortlisted in the Yeovil Literary Prize. The sequel, “Shadows,” is out now. 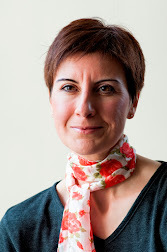 Published by Thunderpoint Publishing Ltd. She runs Get Writing Glasgow.